Under the patronage of His Highness Sayyid Asa’ad bin Tariq Al Said, Deputy Prime Minister for International Relations and Cooperation Affairs, Personal Representative of His Majesty, the Sultan, The National University of Science and Technology officially opened its doors and inaugurated its operations as a University; coincidentally, with the Sultanate’s 48th glorious National Day Celebrations. The University embraces three prestigious colleges in the field of Higher Education in the Sultanate; The College of Medicine and Health Sciences, The College of Engineering and the College of Pharmacy. 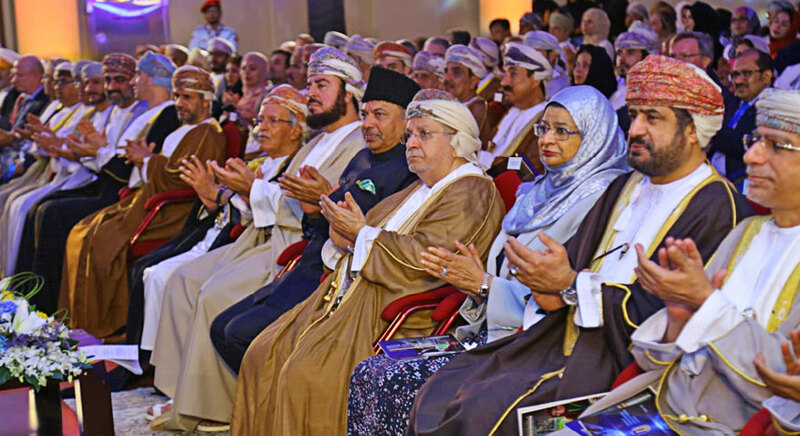 The University is proud to be a part of the higher education development in the Sultanate during the Blessed Renaissance under the reign of His Majesty Sultan Qaboos bin Saeed. The inauguration was attended by important delegates from various Ministries, Highnesses, Excellencies, University Founders and Stakeholders. On the occasion of the 48th National Day of Oman, the Board of Directors of National University of Science & Technology feel honored to congratulate HIS MAJESTY SULTAN QABOOS BIN SAID and the people of Oman. We pray to Almighty Allah for the longevity of His Majesty, The Sultan and wish continued prosperity and progress to all the people of Oman. The Ceremony opened with a welcome speech delivered by Dr. Sheikh Salem bin Saeed bin Hamad Al-Fanah Al-Araimi, the Chairman of the Board of Directors and the Chancellor of the National University of Science and Technology. A video that displayed the establishment of the University and its future prospects was presented to the audience. The key note was addressed by Honorary Prof. Cham Tao Soon, President Emeritus and Founding President of Nanyang Technological University (NTTU), Singapore & Former Chancellor & Chairman, SIM University, Singapore and this was soon followed by a short speech by The Chairman, University Executive Board, National University of Science & Technology, Dr. P. Mohamed Ali. 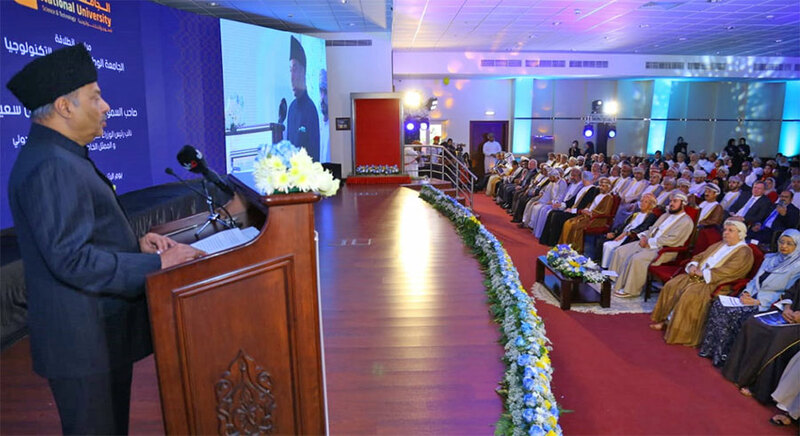 He emphasized the need for aligning the National University with Oman Vision 2040. Felicitations were done by Professor Pamela Gillies, Principal and Vice- Chancellor, Glasgow Caledonian University, UK; Dr. Allie Karshenas, Associate Vice President of Clinical Research, Operations and Institutional Advancement, University of West Virginia, USA and Professor Harris Pastides, President, University of South Carolina, USA. The Chairman of the Board of Directors of NU, Sheikh Salem bin Said bin Hamad Al Fanah Al Araimi and Dr. P Mohammed Ali, Chairman, University Executive Board NU presented a memento to His Highness Sayyed Asaad bin Tariq Al-Saeed, Deputy Prime Minister for Relations and International Cooperation, and the Special Representative of His Majesty, The Sultan. The concluding address was delivered by The Vice Chancellor of the National University, Prof. Simon Jones. The College of Engineering, formerly Caledonian College of Engineering is the first private engineering college in Oman, established in 1996, in academic partnership with Glasgow Caledonian University, Scotland. It is the only engineering college in Oman to have received accreditation from Oman Academic Accreditation Agency (OAAA). It offers Undergraduate and Master’s programs in Engineering, professionally accredited by IET and CIOB (UK). A dedicated centre for Research- Caledonian Centre for Research and Innovation (CRI) houses 17 specialized laboratories, 3 dedicated Research Centers and Mechanical Workshops. The College has 3000+ students from 29 countries, 54% female and 46% male, with around 500 plus students staying in college accommodation and has graduated over 6000 undergraduates and diploma holders, as well as 200 post graduate students. Currently, The Engineering College collaborates with Glasgow Caledonian University (GCU) in the UK, with VIT University in India, and with University of South Carolina, USA. Through these partnerships, the college offers a four-year degree and honors degree programs approved by the Ministry of Higher Education. This campus provides classrooms equipped with the latest teaching aids, advanced laboratories and workshops, computer laboratories, WiFi access, multi-purpose halls, a comprehensive library with access to online libraries, restaurants and coffee shops, and sports as well as recreational areas. A dedicated centre for research: Caledonian Centre for Research and Innovation (CRI) houses 17 specialized laboratories, 3 dedicated Research Centers and Mechanical Workshops. The College of Medicine, formerly known as Oman Medical College, the first and the only private medical education provider in the country was established in 2001 in academic partnership with West Virginia University (USA). The college offers a six year program at Sohar Campus. The MD Program is listed in the health profession’s education directory of the World Health Organization (WHO) and in the International Medical Education Directory (IMED), which enables graduates to appear for the United States Medical Licensing Examination (USMLE). Apex bodies in medical education of many foreign countries, including the Medical Council of India, have accorded equivalence to the MD Program enabling graduates to practice the profession or progress to higher learning outside Oman subject to the rules in the respective countries. The clinical training is completed in hospitals and other healthcare centers of the Ministry of Health situated in Sohar and Rustaq. It is well-equipped with classrooms, advanced laboratories, WiFi, library, hostels for girls, restaurants and coffee shops, sports and recreational areas. 800 plus students from 22 countries are registered, more than 500 students stay in the college supervised hostel facilities. 168 staff members across 12 academic departments and administration units have been deployed. The College of Pharmacy, Boushar, offers a four-year program leading to the Bachelor of Pharmacy degree. The college is in academic partnership with West Virginia University, USA and has been approved by the Ministry of Health and the Ministry of Higher Education. It has over 335 students from 22 countries. The Bachelor of Pharmacy Program of the College of Pharmacy, under National University of Science & Technology, comprises 139 credits of coursework, 6 credits of electives and 600 hours of training components. A student has to successfully complete 145 credits of coursework and 600 hours of training to graduate. The campus includes classrooms with up-to date facilities, advance laboratories, library, on campus accommodation, restaurants, recreational areas, WIFI access and general computer laboratories. Around 84 staff members have been deployed in various academic departments and administration areas. National University also offers a General Foundation Program (GFP) common to all Engineering, Medicine and Pharmacy programs. The School of Foundation is located in Airport Heights Campus, Muscat. Around 500 plus students are registered in this campus. The GFP helps students develop their skills in English Language, Mathematics, and Computing Skills, preparing them for their future specializations provided at the University. The School of Foundation is located in Airport Heights Campus, Muscat. This campus provides classrooms equipped with modern teaching facilities, laboratories dedicated to computing skills and languages, general computer labs, WIFI access, multipurpose halls, library, and restaurants. The hostels provide boarding facilities with e-learning and recreational facilities, prayer rooms, a reading room and study area, laundry facilities, and 24-hour security services. The National University of Science & Technology recognizes research as a key element of higher education and is committed to investment and development of research facilities. Scientific research is conducted in close co-operation with industries, other organizations and the wider community through proven international partnerships and research collaborations. The various colleges of National University have attracted funded research projects worth in excess of 2.5 million US dollars, including funding received from the Research Council (TRC), Industrial Innovation Center (IIC), Middle East Desalination Center (MEDRC) and industry. Research output is distinguished with well over 300 research publications, including participation of more than 200 undergraduate and postgraduate students. The College of Engineering has strengths in numerous research areas, with a wealth of research resources and facilities available particularly in renewable energy, desalination, water and waste treatment. The Centre for Research and Innovation has a dedicated State of the Art laboratory including a Waste to Energy Research Laboratory and a Solar Water Research laboratory to facilitate cutting edge research. The National University of Science and Technology recognizes Medical and Pharmaceutical research as a key element of higher education and is committed to invest in developing research facilities. The Medical and Pharmaceutical research is done in close collaboration with hospitals, industries and other health institutions and medical centers. Special efforts are made to ensure that research benefits students, as well as other stakeholders and the community at large. The University has an established research network to facilitate joint research projects for Faculty and Students. The research is well aligned with MOH research priorities and Health Vision 2050. The financial support to Faculty and Students Research Projects proposals is provided through internal grants to promote research through pilot studies and short term research projects. The Faculty also answers external calls for proposals from the Research Council of Oman and other external funding research institutions and received 16 external research grants in the last few years. NU has also received sufficient funds from external agencies in Medical and Pharmaceutical fields. The students are also involved in research activities through Faculty Mentored Undergraduate Research Award Program (FURAP) and students’ research projects funds which helped students to undertake Research proposals and strengthen the research infrastructure at the University. Lab equipment’s are enhanced consistently through funding mainly by The Research Council of Oman, Internal grants and through other funding agencies. The Faculty takes up research projects in collaboration with private, government and international organizations. The Research projects are carried out in close cooperation with hospitals like Royal Hospital, Khoula Hospital, Sohar Hospital and Ministry of Health etc. The Research of Faculty and students is disseminated through research and review articles in journals of repute. The Faculty and Students are very active at national and international conferences and have won awards at various research forums. Besides that, they are regularly invited to conduct workshops in scientific events both at the national and international level. 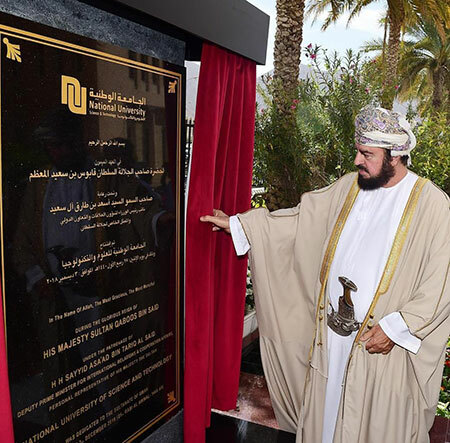 The National University of Science and Technology is a new University in Oman with an aim to transform the educational landscape in Oman and the region. It is indeed a moment of pride and the accomplishment is definitely the outcome of a long and planned process of sustained and dedicated work of all involved. In addition, the big role played by the Ministry of Higher Education and various affiliations has enabled the stakeholders to achieve their goals. In accordance with its vision, the National University of Science and Technology strives to become a trusted, dynamic, leading and socially driven university in the region. 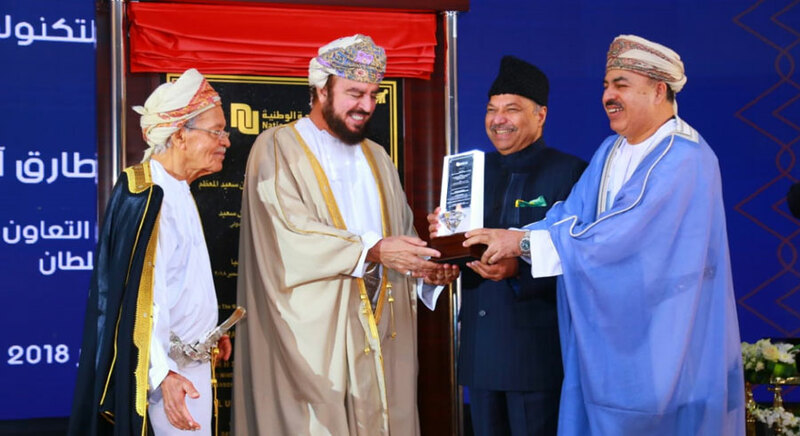 Inspired by the visionary leadership of His Majesty Sultan Qaboos bin Said, the National University of Science and Technology is poised to grow further with more vibrant goals and aspirations.